A Steady Lads & Christine Dunstan production. CODGERS by Don Reid at the Seymour Centre, Sydney. 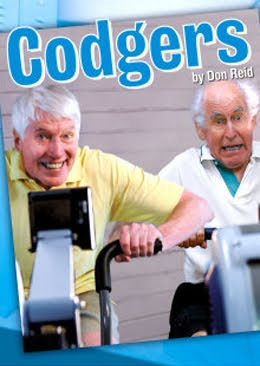 18 months ago I saw the original production of CODGERS at the Riverside Theatres. I waxed lyrically over the cast that brought to life a fairly old fashioned and conventionally structured play. A type of play not favoured by the powers that be in 2010. The players, a team of veterans of the Australian Theatre, gave an afternoon of entertainment and gentle moral enlightenment that, however, for me, transcended any reserves about the play. This new production that is in the midst of a National Tour has been re-cast. Four of the originals still are, delightfully “playing up”: Ronald Falk, as outrageously, wickedly delicious as before; Ron Haddrick, if anything better, and dare I say even more energised and accurate with his characterisation (Where is his fountain of youth? I want some of what he is having); Edwin Hodgeman now gives an even more wily performance, that for its delicacy of choices, steals acting honours for me; and Jon Lam, who seems to be more blithely simple, that on second viewing, must be practising a technique of a superior kind. New comers Russell Newman as Patrick Guiness and Shane Porteous as Rod Dean are sufficient but not yet matching the kind of cheekiness of playing of either the former actors. Russell Newman has not found the depth of ownership to this man and gives a surface, presentational reading to the stock opportunities of the writing, rendering the material to appear caricature. While Shane Porteous in his performance in general and especially in the big speech of the second act displays a penchant for sentimentality that the writing is already overweighted with. It seems it must be underplayed and anchored in a truth of character revelation to be fully palatable in this day and sophistication. Still, both are adequate and on the night, mostly, got away with the bonhommie of this group of men, still learning about life and making startling adjustments to it as they confront secrets and lies of the codgers they thought they knew. The Design of both Set (Nicholas Dare) and Lighting (Nicholas Higgins) have not benefited from the need to tour as both have been simplified and are not necessarily as interesting or successful as out at Riverside. The lighting is not as sympathetic as before and I miss the devastatingly funny lead in, from upstairs of the Gym, of Mr Falk, in the revelatory moments of the second act. This is a delightful way to pass the time. The acting is, mostly, a joy to watch and Wayne Harrison as Director, has a steady hand on the proceedings. I have been spoilt and have memories of a different chemistry in the original casting. However, if you haven't seen these men on stage for a while, do go, for when you see them in action you will recall what they have given us in our lifetimes and wonder why we don't get to see them more regularly in Sydney. Don Reid threatens us with a play called BIDDIES. The possible casting opportunities are tantalising to consider and or wish. "I have a little list", to quote a very old fashioned little operetta. Do you? I am sure Mr Reid would be happy to know what they are. As might his producers.